The Purdue Rowing Team brought “Row-A-Thon 2018” to the Tippecanoe Mall (Lafayette) last Saturday — and drew excited crowds with their fun spectacle of rowing. Row-A-Thon is an annual charity event that raises funds for the LUM Good Samaritan Fund. The Row-A-Thon event yields one of the largest donations to LUM each year — and this year they’re on pace to exceed their goal. If you weren’t able to attend Row-A-Thon you may still make a donation by mail or online (click HERE). Please make checks payable to Purdue Crew Club and mail your checks to: Purdue Crew—Row-A-Thon 355 N. Martin Jischke Drive West Lafayette, IN 47907. Thanks to Purdue Crew president, Hannah Stefanik; Head Coach David Kucik; and the entire rowing team and coaching staff for their continued support of Lafayette Urban Ministry. The LUM Good Samaritan Fund is an emergency financial assistance program which provides our community’s neediest families and children with a strong and reliable safety net. Help is offered for utility bills, rent, and prescription medications. In 2017, the Good Samaritan Fund provided assistance 2,032 times and $115,314 was shared. Purdue Rowing Team presents “Row-A-Thon 2018” in support of the LUM Good Samaritan Fund. Row-A-Thon is one of the largest donations each year. Each year, the Purdue Rowing Team sponsors “Row-A-Thon” in support of the LUM Good Samaritan Fund. Row-A-Thon takes place all day in the Tippecanoe Mall (Lafayette). The co-ed team members row a marathon of 26 miles in three hours on indoor rowing machines while raising funds for LUM. Stop by the Mall on Saturday, February 17 and check it out. Check out the photos from the 2017 Row-A-Thon. The sixth annual LUM Good Samaritan Fund Follies celebrating LUM’s 45th Anniversary was an enchanting evening for the capacity crowd — & all in support of emergency financial assistance for local families. The LUM Follies stage show wowed the audience, and the meal was very special. LUM Follies guests bid generously on an exciting variety of Silent Auction baskets and made specific donations using the Butterfly Tree (community needs with donations amounts) — making this year’s LUM Follies the most successful yet. To view more PHOTOS from the 2017 LUM Follies, click HERE. Deb Parent is a cornerstone of the Lafayette Urban Ministry. She was appointed by her pastor to fill St. Mary Cathedral’s seat on the 44 member LUM Board of Directors in 2006 and quickly became involved in many board leadership and volunteer responsibilities. Deb was elected board president in 2012 and continues to serve on the LUM board’s Executive Council. She supports LUM’s excellent staff through her work as the board’s personnel liaison. She helped lead the implementation of LUM’s Good Samaritan Fund Follies and Port of Hope fundraising events. She was instrumental in the creation of LUM’s endowment for programs and has regularly helped with Hunger Hike, LUM Camp, and Jubilee Christmas. More than anything else, Deb’s involvement at LUM has been defined by her heartfelt concern and compassion for those who are homeless. She spent several years volunteering as case manager helping our homeless guests move off the streets, out of our shelter, and into more self-sufficient living in a home of their own. She even served in an interim position on LUM’s staff as Shelter Program Director. It was her passion in this area that recently helped LUM re-vision its work with the homeless, allowing us to help many individuals off the streets even more quickly than before. Honestly, I don’t know what LUM would do without Deb and her enthusiasm for our mission. The Lafayette Urban Ministry is an organization of 44 Greater Lafayette area churches. We serve as a social safety net for at-risk children and low-income working families. Last year, LUM served 5,175 households. We help narrow the academic achievement gap separating low-income children from their more affluent peers. Through LUM’s Enhanced After School Program, 5th Quarter Summer Learning Retention Program, and through countless educational enrichment activities at LUM Camp, our students excel – they become better readers, more critical thinkers, and are better prepared to learn in school. More than 200 children are served each year. We help to ease the income inequality gap for working families by providing free tax preparation services; emergency financial assistance for housing, utility and transportation services; supplemental food and nutrition aid; and significant family support during the holidays through Jubilee Christmas and LUM’s Community Thanksgiving Celebration. More than 5,000 households were served by these programs last year. We provided overnight shelter to 611 homeless individuals, a winter warming station for 154 more, and helped each of them with the support and direction they needed to leave the streets for a home of their own. During 2016, LUM’s ID Clinic helped 196 individuals regain their lost or stolen photo identification cards. Our Immigration Clinic helped 39 individuals to navigate the U.S. Immigration and Naturalization Service bureaucracy enabling them to retain legal status and to remain with their families. And LUM’s Social Justice Ministry was active in communicating with elected officials about issues affecting those we serve. 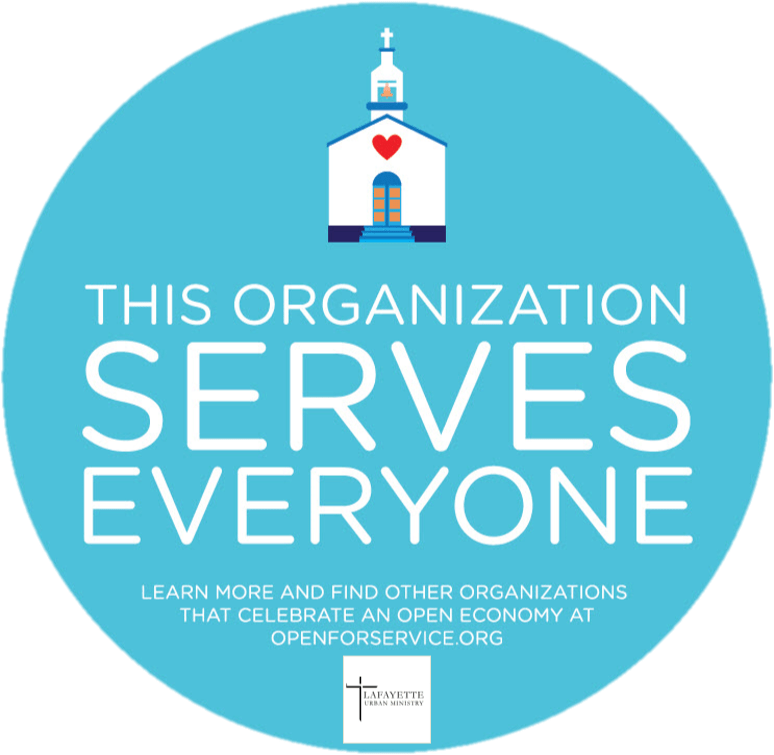 While Deb Parent’s involvement in LUM is indeed significant, she will be the first to tell you that it pales in comparison to the combined efforts of all the others, like you, who help lead, volunteer, and contribute financially to our shared ministry here at LUM. Your past support of the Lafayette Urban Ministry has been so important to all that has been accomplished here. Together, we have strengthened families, nurtured children and made our community a better place for everyone. I hope you will continue your support of LUM by making a generous Lenten season gift of $50, $100, $250, $500, $1,000, or more, today. I can think of nowhere else that your charitable dollars will have greater impact. I can think of no better way to practice our Lenten discipline than to share with those less fortunate. Deb Parent shares that her prayers are always with the people LUM serves – and with those who serve others at LUM through their gifts of time, talent and treasure. She always keeps her eyes and heart open to new ways to be of help to those in our community who are struggling. For Deb, that work has frequently meant active involvement at LUM. I am so very grateful for Deb Parent and for all those whose hard work and dedication to LUM’s mission helps to make our community a more healthy and welcoming place for all of its citizens. Please give generously so that our important work can continue. Place your check in the mail today or give online by clicking the button below. 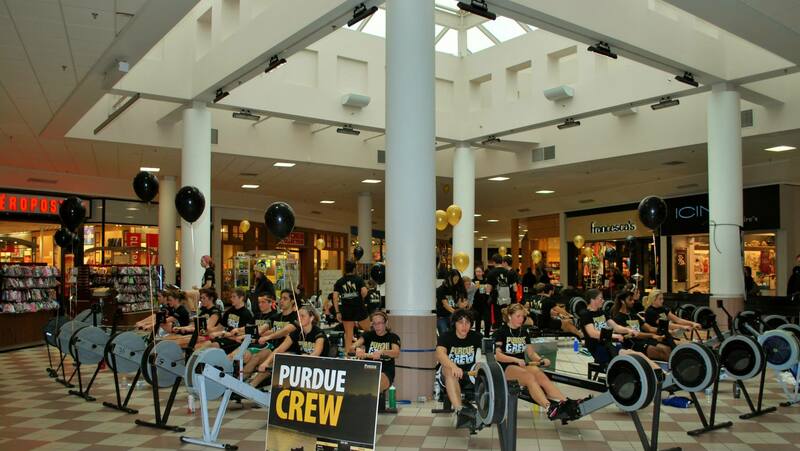 Last weekend, the Purdue Rowing Team brought “Row-A-Thon 2017” to the Tippecanoe Mall (Lafayette) — and drew excited crowds with their fun spectacle of rowing. Row-A-Thon is an annual charity event that raises funds for the LUM Good Samaritan Fund. Each year, the Row-A-Thon event yields one of the largest donations each year — and this year they’re on pace to exceed their goal. During Row-A-Thon the co-ed team members row a marathon of 26 miles in three three-hour shifts on indoor rowing machines while raising funds for LUM. To see more PHOTOS from Row-A-Thon 2017, click HERE. Thanks to Purdue Crew president, David Anderle; Head Coach David Kucik; and the entire rowing team and coaching staff for their continued support of Lafayette Urban Ministry. The LUM Good Samaritan Fund is an emergency financial assistance program which provides our community’s neediest families and children with a strong and reliable safety net. Help is offered for utility bills, rent, and prescription medications. In 2016, the Good Samaritan Fund provided assistance 2,232 times and $114,495 was shared.